Dendera musician Suluman Chimbetu has described sungura giant Alick Macheso as a father figure deserving of his respect. He said he was advised by the late superstar Oliver Mtukudzi to seek counsel from him and that he is part of his patriarchal line which extends from his late father Simon up to the surviving father Allan. “We respect Baba Shero, he is a father to me and Mudhara Tuku even told me to go to him for counsel even when things are not well and I will keep doing that,” he said. In a video on his social media platforms, Macheso in response said he was privileged enough to start music in the days of the late Simon. Macheso has a soft spot for the Chimbetus having also embraced Sulu’s cousin Tryson during his early days in the industry and having to feature on one of his tracks. The two musicians, Sulu and Macheso have shared the stage on a number of platforms and they will be travelling to the United Kingdom together on March 2. 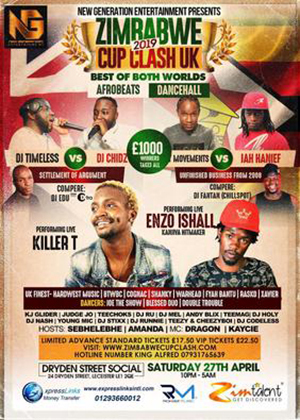 They will be together on the tour with dancehall singer Seh Calaz and Great Man in Leicester. Sulu promised to take Great Man to the UK and this is a fulfilment of the promise he made after their duet which has since become popular. He came with him (Great Man) at the late Tuku tribute at National Sports Stadium where he showcased his singing career.